We performed this Crystal Falls solar window screen installation on August 8, 2017. 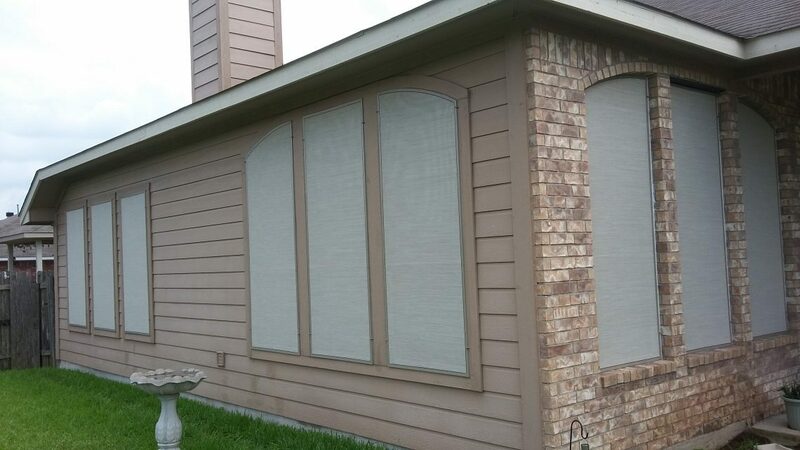 For this Crystal Falls home, we used our stucco solar screen fabric with champagne frame. This solar window screen installation involved an installation of 16 stucco solar window screens. We used our 80 percent solar window screen fabric on all of the windows. The customer did not choose to put the 90 percent fabric on any of the windows. All of these windows open up and down, requiring us to use our metal turn clips to hold the solar window screens up against the window. The windows for this home do not have channeling at the top or bottom to hold a full size solar window screen. Generally, we are not big fans of leaving windows uncovered — however, you can see that over that front door there is a window. The customer chose to not put a solar window screen on that window, and in this situation I agree with him that it looks okay to not have a solar window screen up there. At times can be half a dozen one way or half a dozen the other way as to how it will look. I personally feel that maybe there should have been a screen on that window over the front door, simply for uniformity, because you want all of your windows to have solar window screens on them. For that grouping of windows there to the right of the front door, you will see that there are three windows that open up and down. That’s going to be your two, 17 by 72 inch windows and one 35 by 72 window. There’s a half circle over that 35 by 72 inch window. If the screens were not on the windows, you would be able to see that it’s physically four windows. So that center grouping of windows, that 35 by 72 and that 35 by 18 half circle, those are separate windows. That half circle is just mounted on top of that 35 by 72 window. Point being, when we install our custom solar window screens, we have to use one screen per window 99 percent of the time in situations like this. So for this grouping of windows, that’s a total of four windows. Front of home showing two 17 inch by 72 inch, one 35 by 72 inch, and one 34 by 18 in circle and one 47 by 72 inch solar window screens. For the backside of this home, we installed 10 solar window screens. 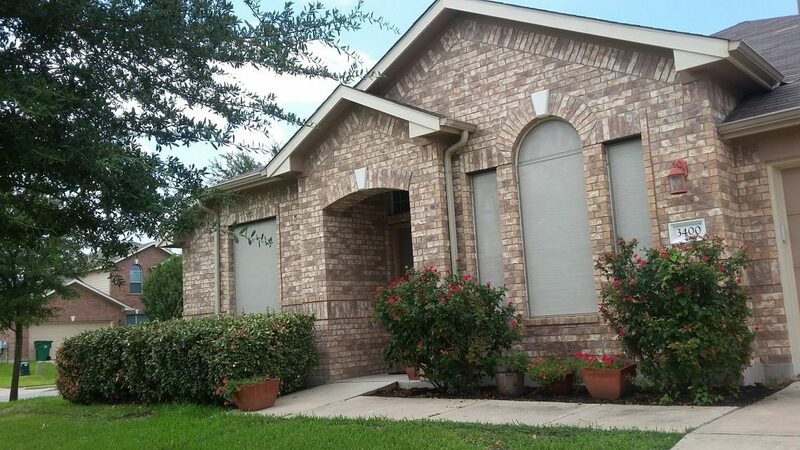 For this Crystal Falls solar window screen home, we used this stucco solar window screen fabric. The stucco solar window screen fabric does go well with the exterior of this home, but I have to warn people that the stucco solar window screen fabric can get dirty and dingy looking, and you have to stay on them by cleaning them all the time. So, while the fabric does look nice, they do require maintenance. We do have a really good window washer that knows how to clean those solar window screens, so if you do want to use a stucco fabric, whether it be for the solar window screens, even our roller shades, then our window cleaner is your go-to person to keep these things clean. You can clean them yourself if you want to, but they do require you taking them down and pressure washing them, using cleaning agents, any cleaning agent will work, and at times using a scrub brush. It can be a lot of work, and our window washer is talented at it, and he doesn’t charge very much to do them, to wash them. For these solar window screens, for this crystal Falls home, we attached all of these solar window screens to the windows by using our metal turn clips. If you take a look about 8 in up from the bottom of the screens, you going to see the turn clips, and then if you look at the top of the screen you’re going to see the turn Clips. That’s what use to hold the solar window screens on to these windows. he backside of the home involved us making four large half-arched solar window screens. These Austin custom solar window shade screens are very tall, measuring 84-inches in height, and they are bent very well to match the curvature of these half arched windows. In between those half arched windows is just a basic rectangular window, which does not have an arch at the top. Because that is the kind of window that is there, we perfectly matched the curvature of each of these windows. Left and back side of the home: 80% solar window screens. One 35 x 60 four 35 by 80 four half arches, two 35 x 84’s and three 35 x 72’s. This window is a glass block bathroom window. If you look closely, you’ll see the glass block pattern behind the solar window screen. We get asked often if we can put solar window screens on glass block windows, and the answer is yes. I tell people if it’s glass, we can most likely put a solar window screen over it. When installed over a glass block window, all solar window screens get screwed into the framing that goes around a glass block window. It’s one inch framing that goes around the window. We don’t aggressively shoot a bunch of screws into the window; what we do instead is uniformly put 1/4 inch down from the top of each leg, and 4 inches up from the bottom of each leg. We do this for all windows like this. They’re all the same. Now what I want you to pay close attention to, is to look at the bottom of this window to the left and right side, and you’ll see a little black line. It looks like a black spot on the left and right bottom side of the screen. Those are called drain holes. These drain holes are provided by the manufacturer of the windows in order for the windows to be able to drain. You never want to cover up the drain holes for a window. Windows are made very well and they shouldn’t need to drain like this, but nevertheless if water gets in from those glass blocks, how they piece it all together, then you will want to the water to drain out. Point being, I have seen many, many, many solar window screen installations out there done by people other than us, that carelessly will cover up those drain holes. To me, it’s just common sense. When looking for solar window screens in Austin that will be done the right way, the only name you can trust is Austin Shade Team. By 48 inch window for the right side. 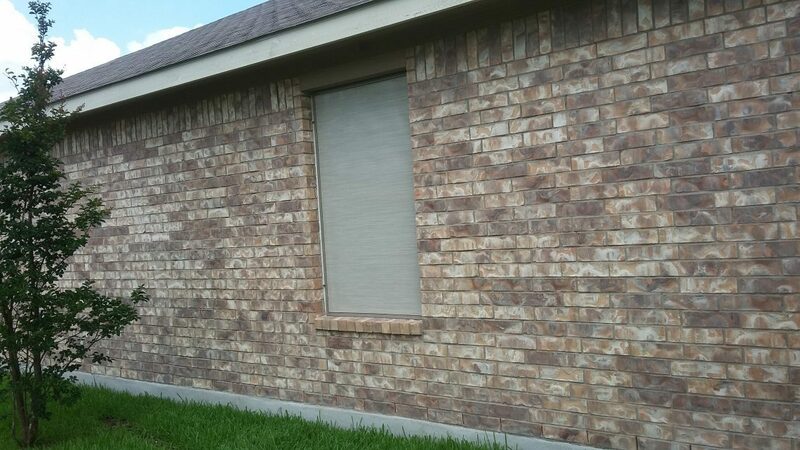 You can see here how well this stucco solar window screen fabric goes with the exterior of this Crystal Falls home. 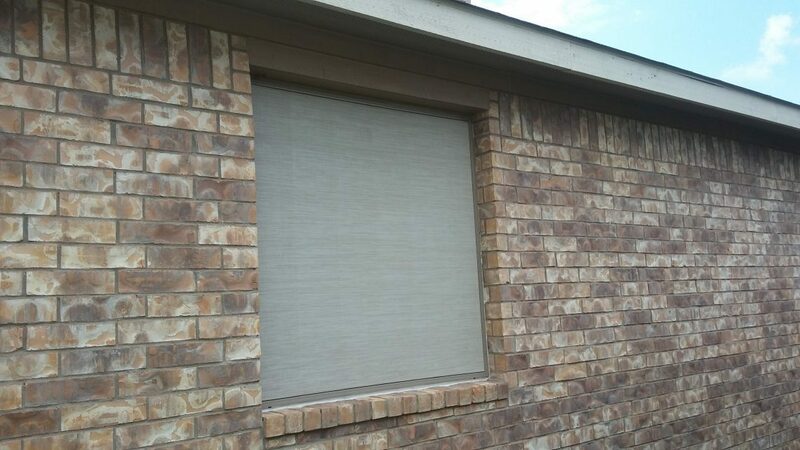 The stucco solar window screen fabric is a pretty fabric, it’s just that some of the windows using this fabric will get dirty and dingy, like some of the bricks, some of the stones and some of the stucco sides of your home do. When you use the dark fabric, they can get as dirty as can be, and you won’t know that they are dirty because it’s a dark fabric. For more answered questions about solar screens, visit this section of our website. 35 by 60 window on the left side. If you’re looking for solar window screens on your home in Crystal Falls, Austin, or the surrounding area, give us a call. We’re here to help.